I've really enjoyed the quiet beauty of our wild violets this year. Gracious Hospitality gives us one more way to use these with a food-safe method of sugaring the blooms. So pretty, hers will take your breath away! 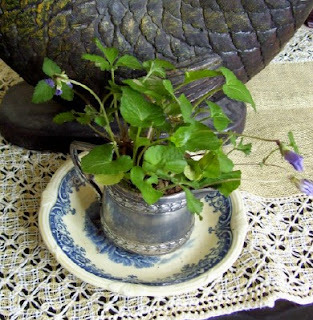 Wild violets grew everywhere at my childhood home. Fond memories! I am honored that you mentioned Gracious Hospitality in your post. I'm also delighted to find your blog! It's very interesting and I love all your healthy, frugal, and earth-saving ideas. Great job! I love that picture. It really warms my heart. My great grandma had a beautiful violet plant. I will have to take a picture of it next time I am at my mom's. I just hope it has flowers on it too.